Hybrid IT, Hybrid Cloud or even Hybrid Infrastructure are terms that you are probably seeing, hearing and reading about everywhere. But what does Hybrid IT actually mean? At Pulsant, we see Hybrid IT as a holistic IT or cloud solution that splits resources across Private cloud and Public cloud environments. 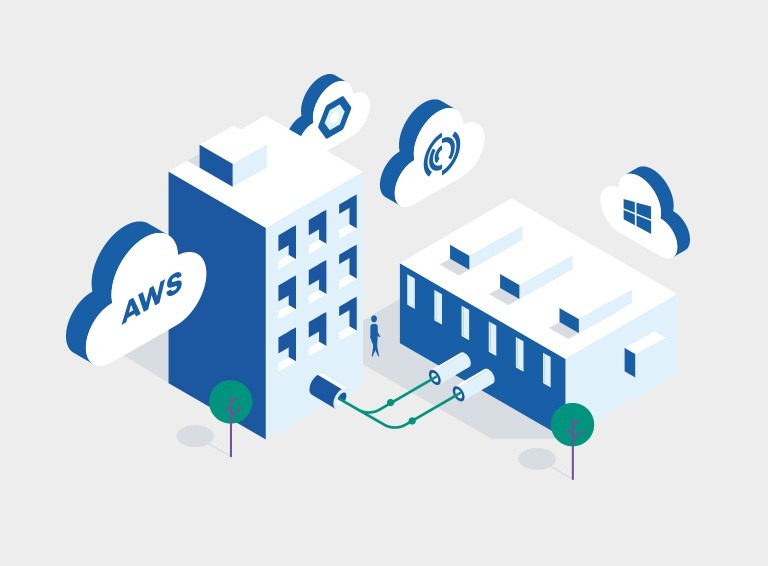 Hybrid IT gives you the best of both worlds: you can experience the flexibility and scalability of the Public cloud, but also retain more control over other IT workloads by putting applications into a Private cloud environment that is tailored to your specific needs. Why would you choose a Hybrid IT environment? Hybrid IT or Hybrid Cloud environments work well for organisations who aren’t yet ready to fully jump into a complete Public cloud solution for their entire IT workload. Most businesses have a mix of SaaS applications, new ‘cloud ready’ applications and legacy applications that can’t be moved to the Public cloud. A hybrid IT infrastructure model lets you put those legacy systems into a Private cloud which you can design and adapt to meet your IT needs, whilst your cloud-ready apps can move straight to a Public cloud environment. Also, organisations who want more control over specific workloads may choose to put cloud-ready apps into a Private cloud environment for security or data sovereignty reasons. With data regulations getting stricter, being more specific about where your data is stored and how it is managed end to end is becoming increasingly important for businesses, so a Private cloud provides scalability combined with increased security and data location control. Some say Public cloud is more flexible, while others think bespoke Private cloud solutions offer more flexibility to businesses. Well, it’s a bit of both. Working with a true Public cloud provider often gives you the ability to scale your workloads to dramatic levels, charge for services by the minute in small increments and define your requirements in a self-service portal, down to the tiniest detail. However, should you need bespoke contract requirements or specific SLA guarantees, then a true Public cloud provider may not be able to meet your needs. Instead, a Private cloud environment with a UK-based provider, such as Pulsant, gives you more contractual and commercial flexibility. And, with the Microsoft Azure Stack, customers are already able to get the best of both worlds by consuming Azure services from within Pulsant’s own UK datacentres. Taking a hybrid approach where some workloads that need increased scalability are delivered from a Public cloud, whilst other workloads and legacy applications are delivered from Pulsant’s datacentres within a Private cloud model, can be the balanced answer to many enterprises’ IT challenges. In short, it’s a multi-cloud approach. Working with a Hybrid IT provider like Pulsant means you get to have one strategic cloud partner who manages your different cloud vendor relationships. Let’s work that example through to give you an idea of what we mean. You may want to put your marketing application into the AWS cloud, and then deliver all of your main desktop applications through Office 365, then migrate your HR and Finance applications and data into a Private cloud within Pulsant’s UK datacentres. This approach could mean you having to manage 3 different suppliers; that’s 3 different suppliers with which to discuss planning, migrating, billing and maintenance. With a Hybrid IT solution, businesses can remove the headache of managing those relationships, delivering you one central service across a hybrid mix of clouds to fit your business.